It’s Europe’s most popular tourist destination, but tonight only, someone will actually sleep in the Guinness Gravity Bar in Dublin. The iconic glass bar at the top of the Guinness Experience in Dublin is usually a place for crowds of people to try a real Guinness. But staying there overnight is not an option, no matter how many you’ve had. Until tonight. You’ll begin at Thomas Street, Arthur Guinness’s home residence. The magic and mystery will begin to unfold as you step through historic railway lines, across cobbled stones and through the underground tunnels. A level of access no public visitor ever gets! Then, you’ll learn to pour the perfect pint and explore the wonderful world of Guinness advertising and the best views of Dublin city from our Gravity bar, which boasts a 360-degree panoramic view of the city below. By now you should be feeling at home. Take a few hours to relax, before our expert Beer Specialist and Executive Chef pay you a visit to serve up 6-courses from our Guinness-inspired menu. 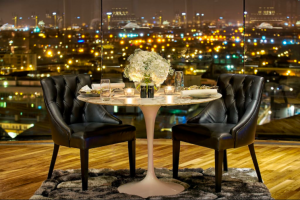 Reflect on your day of tastings, trivia, and VIP access as you enjoy culinary delights accompanied by an incomparable 360-degree view of the city. 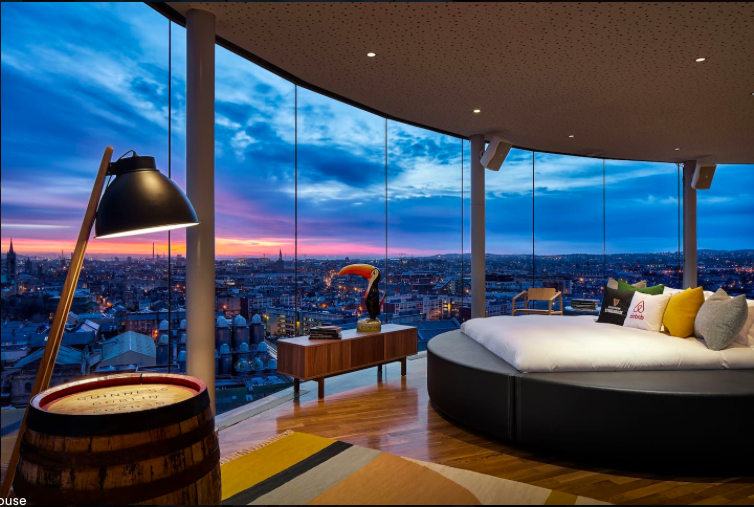 Gaze upon the city with your favorite music playing in the background of your loft room that is fully outfitted with the best Sonos speaker to set the scene to a truly unforgettable evening. Get ready for bed as you’ll sleep looking out to the stars over Dublin. You are now in Ireland’s most exclusive bedroom. The first person to call this home, without having Guinness in their name. But it doesn’t end there… the next morning after breakfast, our Brewer Peter Simpson will teach you all about the basics of brewing, the various ingredients and what makes Guinness made of more. The competition ran in March and the winner will be checking into their unique experience tonight. Envious yet?